Yesterday I wrote about the Rosetta mission, and today I write about it again, because a) it’s eclipsing most other science news anyway right now; b) the landing was successful; c) something really interesting happened after touchdown, and it took me a little while to figure out the mystery. “We are there. We are sitting on the surface. Philae is talking to us.” – Stephan Ulamec, Philae lander manager. Ten years in the making, this triumphant moment in space expedition involved a lot of dedicated people’s work, and the experts spanned many countries from several continents. The project is run by the European Space Agency (ESA), an international organisation with 20 member states, as well as several cooperation countries. When Philae landed, it tweeted this announcement in several languages – 18 to be exact, even though some people on Twitter got over-excited and claimed the lander knows, like, all the languages in the world and stuff. For a European space mission it’s befitting to celebrate the diversity of the mission via an array of the languages spoken by mission specialists. I think it’s a lovely touch. However, my attention was caught by the inclusion of Latvian. 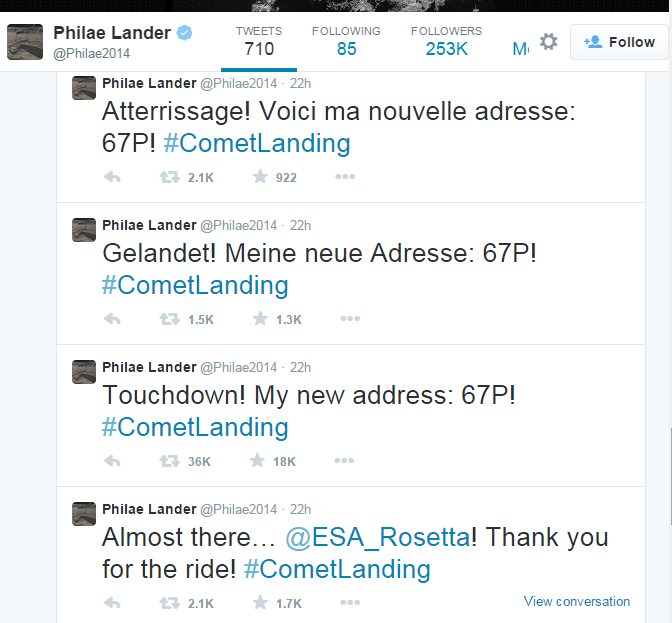 My first thought was that perhaps Philae tweeted in all the languages of the European Union, but I was mistaken. Even though there are ties between the EU and the ESA, their membership doesn’t overlap directly. The EU has more member countries, and it has 24 official and working languages, including the big guns like English and French, as well as the tiny ones, like Latvian and Estonian. Thanks to Philae recording its historical milestone in my native language, I learned that Latvia is indeed one of the ‘cooperating states’ of the ESA, which doesn’t mean a full membership, but a certain level of contribution nonetheless. As I kept hunting for the reason behind “the 18,” it became clear that most of the languages Philae used on Twitter are indeed from ESA member and cooperating states. Again, that’s a lovely touch… but I do think at least one language is missing, and meanwhile there is one that isn’t listed on the member states webpage. Can you spot them?